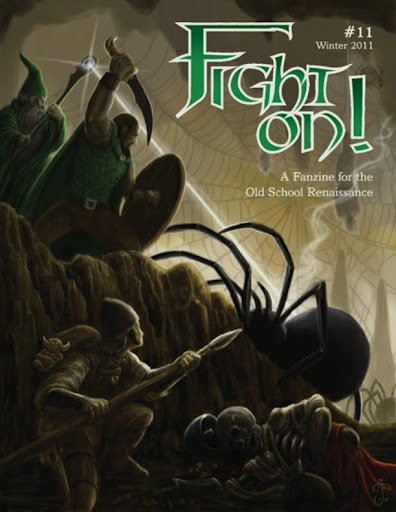 I’m working my way through reviewing the adventures in Fight On! magazine. The magazine proper is a great resource to get your imaginative juices pumping. There are lots of articles to get you in to the right frame of mind to create imaginative adventures for your players. Lux gives us a small wilderness areas is 17 or so encounter areas and then a 25 room dungeon tomb at the end of the wilderness. There is not really any hook; the party is looking for the fabled burial place of the last barbarian king. This brings them to the Valley of the Lost, the wilderness area to explore. While there are 17 or encounters in the valley, most are ’empty’, in one manner or another. There is a beast encounter, a village of morons, and … a set of symmetrical encounters. Let’s cover the good first: Even the ’empty’ encounters have something going on. There’s a great section with a cursed priest and lots of smashed ruins to look in to. The ruins generally have something to find that is interesting: a spell to learn, or something related to the history of the valley. The village is one after my own heart. I LOVE moronic villagers. Nothing gives me more pleasure then having a village of idiots doing stupid things when the party comes by. “Yup, we moved that glowing obelisk in to the center of the village to use as a maypole. Nope, don’t know why people are suddenly going missing.” That sort of thing makes my day, and this village is a good example of that. So cowed are the villagers by their former barbarian masters that they refuse to leave the village even today when their masters are long gong. On the down side, the wilderness section has some plain magic items (+2 shield, etc) that could use more personalization, something to make them memorable. Then there’s the symmetrical encounters. The barbarians venerated four animals and there are four shrines the party can visit to have an encounter/challenge. I hate this. I hate symmetrical temples, I hate symmetrical dungeons, I hate symmetrical encounters. Too much is forced and lost in same of the symmetry. I find them boring as hell. But, maybe you love them, in which case there are four in the wilderness section. Have at Thee! The tomb complex of the last king is the last wilderness encounter. It has 25 encounter areas. The tombs layout isn’t terrible and nor is it particularly interesting. The encounters are mostly with undead and a couple of vermin like slimes or cubes. The tomb encounters are very nice and all generally have something out of the D&D ordinary going on. Loot the chamber? The corpses come to life. The various burial chambers are all enough different to keep the parties interest: a dais with a sarcophagus, coffins in the rear, etc. There’s also some nice things to play with. including a series of potions one of which has got to be one of the best I’ve seen yet: a great description of what amounts to a Ju Ju Zombie transformation. It’s even fair in a very old school fashion. This is a decent adventure; I was pretty happy with it. for … 5th level characters? This is a 34ish room three-level dungeon set in a sea cave. It bears some resemblance to the second half of module N1 – Against the Cult of the Reptile God: a water-logged dungeon with a mesmerizing she-beast at the bottom, past groups of charmed or loyal guards. The set up is very basic, consisting of just a few short sentences suggesting some hooks: shipwrecked, prisoner rescue, looting the dungeon. The location is neutral enough to support a wide variety of hooks to get the party involved. The map isn’t going to win any awards: three levels, a simple layout on each level, some portions submerged. Nothing too unusual or special there. A few more interesting features would have been nice, rather than just room after room branching off a corridor. The various encounters fit the same mold. The creatures all seem to have some relation or another to each other or some interesting tidbit: a one-armed ghoul, an honorable barbarian, bored guards, and so forth. Unfortunately there’s not much going on beyond this. The magic items fall in to the “+1 shield” category most of the time and just are not that interesting. The rooms don’t have much going on either. generally just a creature with some sort of quirk. There are a couple of exceptions, notably a statue for the players to explore, however for the most part this adventure seems to be a straight “go in and kill it” type of affair. As such, some Order of Battle would have been nice so the occupants could respond to strong incursions by a band of murder hobos. There are a few people inside for the party to interact with, however that’s unlikely IMHO. This is mostly a straight-up hack with named NPC’s to hack instead of nameless monsters. This level of The Darkness Beneath community megadungeon has one fatal flaw: it’s name. If the party finds out the place is called The Palace of Eternal Illusion then most of the tricks turn in to the mechanics of disbelieving instead freaking the party out. A There’s about 27 rooms in this level in a very basic layout. The best analogy is going to be a very simple manor home. We’re not talking Tegal, but rather the maps that accompany a small 10 room manor. Simple rooms adjacent to rooms, and hallways with doors of of them. The wandering monster table is strongly themed with shadow-type creatures, hounds, dragons, Shadows, nightmares, wraiths, etc. Nothing too interesting there other than the theme .. again a give-away that illusions are coming. The encounters on the level follow much the same pattern: shadow-themed creatures interspersed with phantasmal killers … real or imagined. There’s really only two very interesting things on the level: a set of bottles full of liquids to play with/drink and the lich who lives in the palace. I love dungeons with interactivity and the various bottles surely provide that. The illusionist lich (hmmmm, maybe he’s actually a butterfly?) is also an interesting fellow; he’s bored and wants to talk. That’s actually pretty interesting as a part of the larger dungeon. He can provide information, send them on missions, etc, if only the party can put up with him … and in a polite manner. The mundane treasure is a strange mix of interesting (a gold bar, he stand for a crystal ball, etc) and the uninteresting “gem worth 200gp” and the like. The magic treasure is almost all generic and straight out of a book, with one of two exceptions, like a gem that confers fire resistance and immunity to light-based attacks. THAT’S the kind of magic treasure I’m much more interesting in seeing in a module. There’s some potential with this level, but in the end I found it too … themed? straight-forward? and mundane to be exciting. Good point about symmetry; I realise the flaw. The four encounters are a bit same-y, and it shows, especially if encountered in succession. I will dispute the “empty” encounters, though. What makes the wilderness run in practice is the sense of dread and the unforgiving environment. You have to explore to find your way with the little info you have (and there are red herrings), but the random encounters with the phantom warriors and shade wolves really grind down the party’s resources. In our game, it involved desperate siege situations and a lot of running away from sure defeat. This is the central dynamic of the wilderness section. WRT the dungeon section, the original version of the tomb was written in something like 30-40 minutes before our game session, and that included the 3.0 stats. It has rough edges here and there, but in a sense, I like it more than ten years after first creating it – and wrote it up for publication – precisely because it is so stream-of-consciousness and raw. And both times I have run it, it has played well, with some hairy situations and dangerous hazards. About the Darkness Beneath level – “Dwelling of Timeless Phantasms”, “Hall of Boundless Vistas” or some other “synonym salad rename” should help with blindsiding the party a little, no? As an aside and probably overthinking things that don’t need real explaning, but how does a Illusionist becomes a Lich when they lack most of the magics necessary? Did someone do it a solid, or what?